Three days before the 1969 Super Bowl, Joe Namath promised the nation that he would lead the New York Jets to an 18-point underdog victory against the seemingly invincible Baltimore Colts. 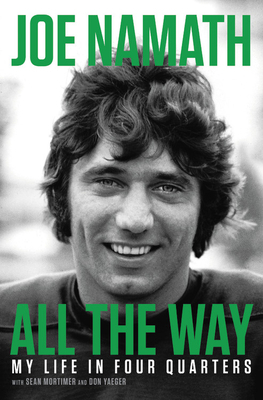 When the final whistle blew, that promise had been kept: Namath was instantly heralded as a gridiron god, while his rugged good looks, progressive views on race, and boyish charm quickly transformed him - in an era of raucous rebellion, shifting social norms, and political upheaval - into both a bona fide celebrity and a symbol of the commercialization of pro sports. By 26, with a championship title under his belt, he was quite simply the most famous athlete alive. Joe Namath is a former American football quarterback and Hollywood actor. He played for the New York Jets for most of his professional football career and played his final season with the Los Angeles Rams. He was elected to the Pro Football Hall of Fame in 1985.